The three-time Tony Award-winning musical Avenue Q makes its Vancouver debut this February. 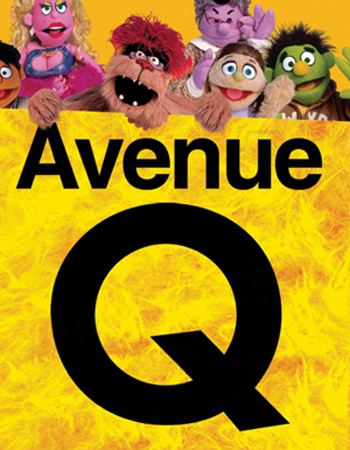 Often-described as an adult-take on Sesame Street, Avenue Q uses puppets to tell the story of a recent college graduate who moves to New York to find his place in the world. Music and lyrics by Robert Lopez and Jeff Marx, book by Jeff Whitty, and based on an original concept by Robert Lopez and Jeff Marx. Directed by Jason Moore, puppet design by Rick Lyon, choreography by Ken Roberson, scenic design by Anna Louizos, and costume design by Mirena Rada. Starring Kerri Brackin, Ashley Eileen Bucknam, David Colston Corris, Lisa Helmi Johanson, Tim Kornblum, Michael Liscio Jr., Anita Welch, Ben Hart, Laura Yumi Snell, Katie McCreary and Zach Trimmer. Work Light Productions presents Avenue Q, from February 1 – 5, 2011, at The Centre in Vancouver for Performing Arts, 777 Homer Street, Vancouver. Tickets are available online or by phone at 604-280-4444.